My name is Giulia, I was born in 1983 in Germany, and I’m a private German teacher in Munich. I have been in touch with many language since I was born, this is why I know very well how difficult is to speak a new language. But at the same time I know how important is to feel good in a new environment. For this reason I decided to enter a linguistic study. I graduated from the Ludwig Maximilian University of Munich with a dissertation thesis on an italian dialect, and beside German -my mother tongue- and Italian -my second language- I also speak English, French and Polish. I’m a polyglot. 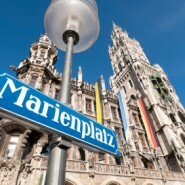 Since 2007 I teach German and Italian in some language schools in Munich. I have to admit that, while this gave me the opportunity to sum up teaching experiences I didn’t like the way schools behaves. Since 2012 I started with my own activity as private German teacher in Munich. In this way I had the opportunity to develop my own teaching style and my method, that I believe to be quite effective as I see every day people becoming proficient in German or Italian. This is why I’m doing this job, the satisfaction to teach someone a language. My private lessons are very dynamic as I’m convinced of the usefulness of the dialog between teacher and student, so I always try to adapt my lessons to the needs of the student. If you want to learn German with private lessons (Privatkurs) or together with a friend (Paarkurs) don’t hesitate to contact me. More info on the page My Lessons. Or go directly to my contact page.